Neal Manufacturing’s 1,500-gal. (5,678 L) capacity ESSP 1500S skid-mounted sealcoating machine features an invariable speed control and produces as much as 100 gpm (378.5 L) for coverage up to 40 percent faster than diaphragm systems. The 1,500-gal. (5,678 L) capacity of the ESSP 1500S skid-mounted sealcoating machine from Neal Manufacturing reduces the time associated with refilling the tank on large projects and the number of trips a contractor needs to make to the sealer manufacturer or distributor. In addition, the unit's electric super sand pump (ESSP) system features a variable speed control and produces as much as 100 gpm (378.5 L). With this system, operators can cover areas up to 40 percent faster than diaphragm pumps, according to the manufacturer. The 1500S features an in-line surge tank that reduces material surging to ensure continuous flow of material for uniform coverage. The hydraulic agitation system with chain reduction features a three-blade design; the blades are offset to ensure two blades are in the material at all times, which produces a more thoroughly mixed product. In addition, the shaft of the agitator is made with solid steel for added strength, durability and long wear life. The control panel on the 1500S allows users to change the direction and speed of the pump and agitator, and provides accurate control of the water cleanup system. The contractor can access the tank through the 21-in. (53 cm) manway, which includes an interior safety lid and sandbag splitter. The hydraulically driven, electrically controlled ESSP system features Generation III pump heads that serve as the brain for the system and feature a specialized, time-tested design for reliable pumping power. The pump includes 2.5-gal. (9.5 L) material filters that capture more debris so the machine can spray longer between filter cleanings. Further, the ESSP pumps have 75 percent fewer parts than traditional air pumps. Their leather cups tightly seal to the plates inside the pump to prevent material from leaking. While diaphragm pumps require daily flushing to prevent their rubber seals from degrading, the leather cups in the hydraulic piston pumps only need to be flushed once per year, which can save up to 30 minutes per day. The seals last up to 200,000 gal. (757,082 L), depending on the sand load. Neal's pump offers more power, increased suction and the ability to spray larger volumes of materials with heavy sand loads, either through multiple hand wands or a spray bar. 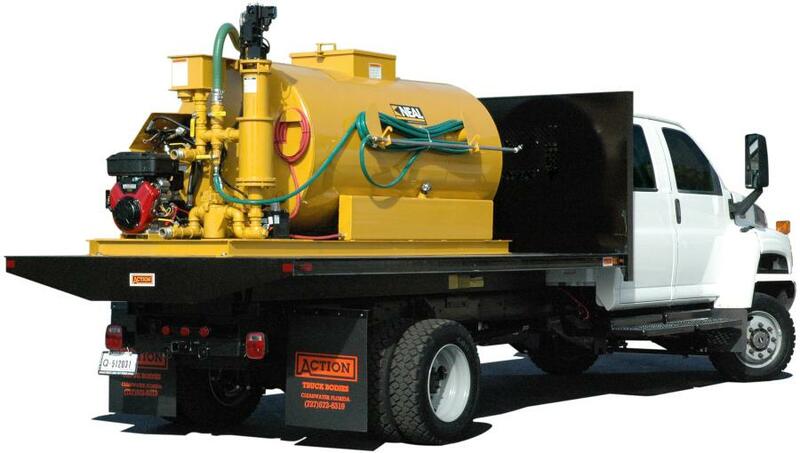 The unit comes with 75 ft. (22.8 m) of reinforced hose, a 6-ft. (1.8 m) hand wand and a six-nozzle spray bar. The high-volume pump also can supply material to an optional distributor bar, which is capable of an 11-ft. (3.3 m) wide pass, or to a second hand wand for greater efficiency. An optional hose reel can reel and store 75 ft. of hose. An 18-hp Kohler Command PRO V-Twin gasoline engine powers the ESSP system and delivers high torque for strong material mixing in the tank. The pump also provides on-demand action; since it pumps only when pressure drops during spraying, it consumes less horsepower, reduces fuel consumption and increases engine life. Neal Manufacturing also offers free training seminars on proper operation and maintenance in Anniston Ala.
For more information, call 770/830-1282 or visit www.nealequip.com.